1. [Imaging System] Adopt DLP 0.3" DMD Technology which use advanced Multi-Color processing, producing exceptional contrast ratios. OSRAM LED Lamps with 30000 hours of lifespan, features 100 ANSI lumens brightness, 1000:1 Contrast Ratio and 854*480 Native Resolution, supporting up to 1920 * 1080 (for a 1080P video-allowing you to watch your favorite movies in high definition), bringing you a projection size of up to 120 inches. 2. 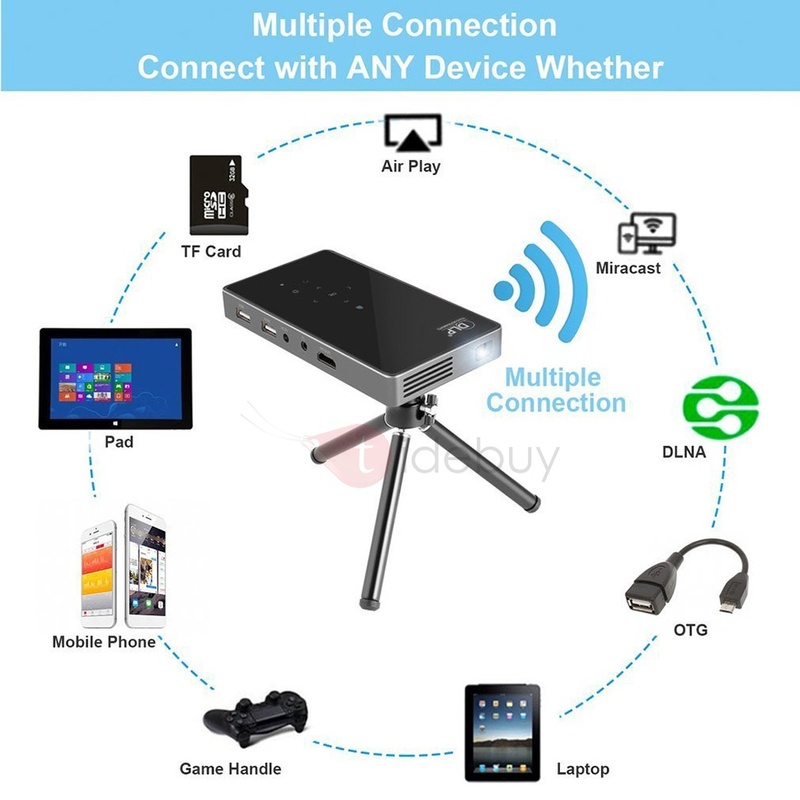 [Truly Wireless] Support 2.4G & 5G Dual Band Wi-Fi up to 1000M/s, movie never pause, no need waiting anymore. Android 4.4.4 System lets you enjoy a mass of online videos & games. And it supports Airplay, DLNA and Miracast Wireless Display through Wi-Fi connection. 3. [Unique Design] Off-axis Ray Engine, Imported Hardware; Adopt Advanced Optical Engine which is imported from America and uses the newest 0.3inch EM off-axis technology for Horizontal Projection, providing a much better user experience. 4. 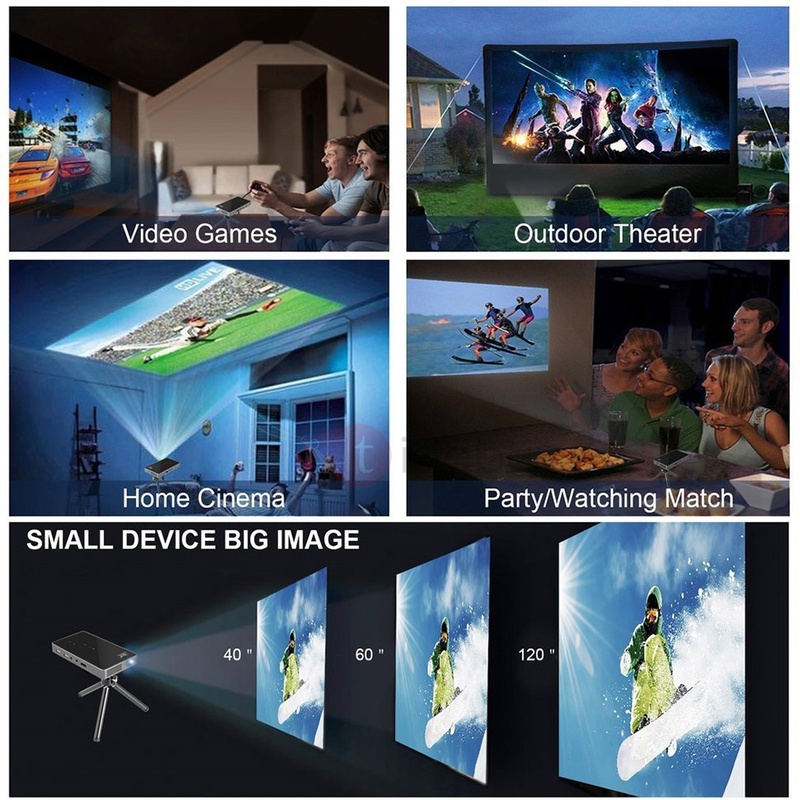 [Cute and Compact Portable] Adopt light and compact portable design, DLP Projector owns palm size (15 * 8.0 * 1.8cm). Fit an entire home entertainment system in your pocket. You can easily carry with you, watching all your favorite movies or making an impressive business presentation anytime and anywhere. 5. [Large Capacity Battery & Durable] Built-in large capacity 4500mAh rechargeable battery, running for up to more than 2.5 hours with a single full charge when the external power is not available.With a three-color backlit keyboard can be more convenient to operate TV box You can play thousands of android games in a large screen smoothly.